A lightweight wearable eye tracker designed to comply with motion capture conditions. 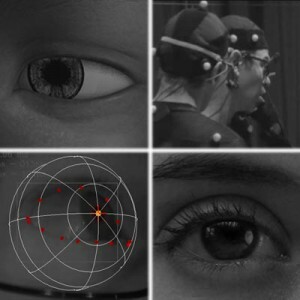 After a decade of research on combining eye tracking and motion capture, Rémi Brun and his team back in 2004, were the first to build a portable eye tracker intended for motion capture sets. This device was intensively used at Attitude Studio for “Renaissance”, the first feature film to use eye tracking. From then on, this research has continued. Today MocapLab has its own hardware and software eye tracking solution that it’s constantly improving to satisfy its customers’ and partners’ needs. It is so robust and accurate that it is used for over half of MocapLab’s projects and also by scientists in their research on vision or locomotion. As we have full control over the hardware and software, we can adapt them to your specific needs. In order to benefit from our eye tracking solution, please contact the team at MocapLab for more information.